engines) to reach for the stars myself and apply for the astronaut program. challenged us to go to the Moon, and like children, we believed that we could. do anything we set our minds to. by the desire to go there. To explore. To, yes, go where no man has gone before. a railroad to the stars, allowing humanity to follow. national ambition. But I won’t lose hope for the future of space exploration. why: he wanted to recapture the national ambition to go to space, just as I did. 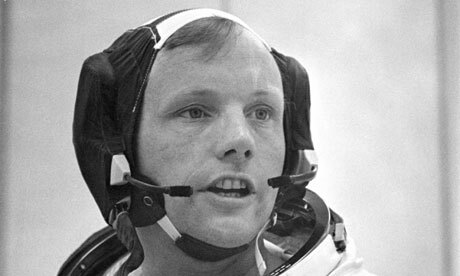 I, too, cried when I heard about Neil Armstrong's passing and I cry now as I read your blog post for the day. You captured so well what is in my heart for what we have lost and what hopes were dashed. And I have great hope that somehow "Curiosit" will win us back to a committment to science, exploration and the dreams of children to go to space. Thank you so much for saying what, I am sure is on the hearts and minds of many others this sad day. Cool thing #2,345 about the modern era: my mom visiting my blog, after seeing it on Facebook, probably even before she got my email. RIP indeed. I was truly sad when I read about this today. He's an icon. You summed up my sentiments exactly. I feel numb today. I keep thinking, Wow, the first human to walk on the moon is dead. Even worse, it's been over 50 years and the space program is a mere shadow of what it was in the 60's. Glad to hear your hopeful thoughts and positive spin on the future of space travel. Look forward to checking out the links you provided. It's been a surprisingly emotional day for me too! Thanks for leaving your thoughts – and I hope you will find private space exploration as exciting as I do! I think sometimes that we've not only lost a lot of our ambition, but a lot of our imagination — because it's our imagination that fuels or ambition in terms of exploration, both in a sense of "what might be out there?" and in a sense of "What can it do for us?" We've lost our ability to dream. And that is a bit like a death. Thank you for writing this. Somehow, some way, I had not yet heard that Armstrong had passed away. I'm glad these were the first words I read. Thank you, Bryan. The failure of imagination explains a lot of the world’s problems, one reason why I don’t think what I do now (inspire children’s imaginations) is any less important than what I used to do (design engines). In my own small way I try to enthuse others about Space and all the possibilities as I was enthused through great Sci Fi writers who flew from the backs of the Apollo astronauts…read it… watch it begin to happen. When the funding cuts came at NASA we were as devastated as the science community in the US…What other country had the vision and the ability to reach for the stars on a world wide scale…I watch with interest the private investors in the 'Space race'…applaud their efforts but also feel that Neil Armstrong was right…we have lost worldwide ambition to go forward into space that the Apollo missions sparked. Thank you for encouraging others to see the possibilities! Leadership is helping people see more clearly the way, and in that way Armstrong was a tirelessly leader and champion of Space Exploration. "we believed that we could." Susan, nobody could have said this better than you did in this post. It makes me sad that we seem to have lost so much hope and energy and will to reach for the stars. Neil Armstrong will forever help us remember that it is possible if we believe. Belief is so tremendously important. It carries us when the rational side wants to see nothing but obstacles. Like Bryan said, it is the dream that gets us started. Thank you so much for your comment. You've expressed so beautifully why so many of us felt/feel Armstrong's passing so keenly. Thank you. Thank you, Jemi. It’s reassuring, in a way, that so many people feel so strongly about this. It gives me hope. I remember standing with my brothers, staring at the moon, and swearing we could actually see Neil Armstrong walking around. I was raised on the space program and I'm sad we've lost the wonder of being star voyagers. Beautiful post. My daughter is so bummed about this too. She just shared a photo of him walking on the moon on Thursday at school and gave a speech about why it was important to her. She wants to be an astronaut, and to have both Sally Ride and Neil Armstrong die before she could meet them made her really sad. Oh, that is sad! But I love that she was so excited about him, in a way. If she’s anything like me, it will just strengthen her resolve to follow her dreams. He is the astronaut I remember the most, even though I was a young toddler when he landed on the moon. I read a book about the Apollo missions to the moon this summer, and even watched some footage on YouTube from the missions. It was so fascinating! It does make me wish we had a stronger push to explore space like we did in those days, though there was also the competition with the USSR. I love how you describe those years as the childhood… and then we became cynical adults with Curiousity but no ambition (nice play on words). I wonder what it would take to change again, to have a sort of second childhood? I’m not sure – I think the collective will may be gone, but the individual spirit lives on. Until something seismic shifts – like China manages to make a rocket that doesn’t blow up half the time, and suddenly they have a moon base too. Perhaps it will take that naked military competition again, like we had with the USSR. We don’t normally link the Cold War with Space Exploration, but that was an important part of it. Now, we have terrorism, not nuclear Armageddon, hanging over our heads. Even the wars have gotten smaller in focus. Sometimes it takes an individual forging ahead, while the rest of us watch and wonder. I truly think this will be the era where Private Space Exploration makes the leap for us. It will be driven by commercial exploitation of the cosmos (do you KNOW what they have in those asteroids? There’s some serious pirate booty waiting for the first to claim it). This isn’t bad, it’s just a very different thing.